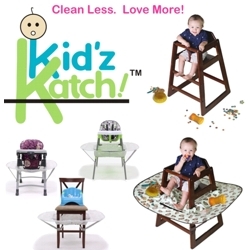 YUCAIPA, Calif. - Nov. 16, 2016 - PRLog -- Kimberly Ballard, mother of two and creator of Kid'z Katch!TM, designed the attachment that not only prevents food and items from landing on the germ infested floor, but also helps eliminate messy spills. Meal time with a baby is often frustrating. Food and items available to baby are repeatedly dropped onto the floor. It's a frequent cycle of pick up, disinfect, sweep, mop and repeat. At home where the floors appear clean, germs are still present. The "five-second-rule" has been debunked. Studies show cross-contamination may occur instantly upon contact and is a contributor of illnesses such as Salmonella, Staph A and E. Coli. Dining out with a baby is often frustrating as well. Food and objects given to a baby inevitably end up on the floor, and items can't be given back to a baby unless disinfected since babies explore with their mouth. There's also an embarrassing matter of baby's food mess on the floor. "I grew tired of bending down, picking things up, disinfecting them, sweeping and mopping the floor- just to do it all over again. I thought there had to be a product out there for this problem. There are a few products, but they don't practically solve all the problems. I sketched out an idea, then made my own solution. It wasn't until after we brought it to restaurants where many patrons and staff expressed enthusiastic interest that I realized I should make this available to others". Kimberly was granted a utility patent, and developed Kid'z Katch! with top priorities of working functionality, compatibility with most high chairs and standard chairs, affordability, and ensuring it's easy to use and clean. KNB Innovations conducted a recent marketability survey. The results showed 99% of respondents have not seen a product like it before and 92% of respondents faced the problem Kid'z Katch! is designed to solve. Product is currently in production and is expected in January 2017. Consumers can pre-order the Kid'z Katch! by becoming a backer in the Kickstarter campaign.